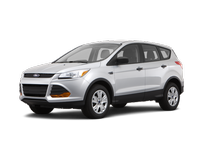 The current Ford Escape stands as one of the top entries in the very competitive compact crossover segment. There are three trim levels: S, SE and Titanium. The S comes with full power accessories, air-conditioning, the Sync voice command system, a rearview camera and a six-speaker sound system. Highlights of the SE include a turbocharged engine, keyless entry keypad, a power driver seat and satellite radio. The Escape Titanium further adds keyless ignition/entry, the MyFord Touch electronics interface, dual-zone automatic climate control, leather upholstery, heated front seats and an upgraded sound system.